Hi, I am interested in your 1950 Chevrolet 3100 (stock #5036-CHA) listed on Autotrader for $32,995. I'd like to get more information about this vehicle and confirm its availability. 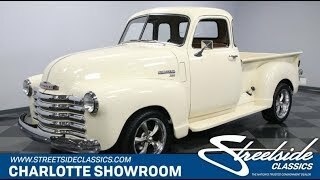 A 1950 Chevrolet 3100 with the desirable 5-window cab is always a great classic. But when it also has been upgraded with V8 power, a better suspension, and more comfort, this classic pickup becomes a true all-around cruiser. This one gets the iconic look right with a bright chrome bumper, and an even brighter art deco grille leading the way. Its a true classic with the complete trim, stepside truck bed, and glossy real wood lining that bed. Plus, collectors know the value in having the extra glass of a 5-window cab. But more than just a true classic, theres also plenty of hints at a custom attitude with the flush roll pan, wide dual exhaust tips, and bright Ridler alloys with a nice 17/18-inch front/rear stagger for a sporty stance. Inside the tasteful tan goes nicely against the exteriors creamy white. They took their time to give this a unique interior with everything from a nice pattern on the bench seats to a custom Chevy bow tie embossed in each door panel. Some upgrades a subtle, like the plush carpeting or electronic windshield wipers. Other are more noticeable like the AM/FM/CD stereo with aux input for your iPod. But all of these additions go to making this a truck that feels like a nice place to spend so time. You even get a grippy later-model Chevy truck wheel on a tilt column. And this gives you a great view of the full Dolphin gauge cluster. The engine bay is filled with small block power. Chevy was a long way from offering a V8 trucks in 1950, but the benefit of a full custom means this very worthwhile upgrade. The 305 cubic-inch V8 looks nice with the flame-etched valve covers, bold block, and bright air topper. It has been enhanced with an Edelbrock four-barrel carburetor and Edelbrock Performer EPS intake. This not only adds power, but also contributes to the sweet sounds of the dual exhaust. This is built to enjoy on the road, and so it has a three-speed automatic transmission, power steering, and power brakes with discs up front. In fact, there are some nice upgrades you dont find on many custom trucks. For example, the aluminum radiator helps keep this running cool in all conditions. Plus, the suspension has car-like features such a thick front sway bar and a triangulated four-link rear, which provides you with a far smoother ride than most 50s pickups. This is a thoughtfully build custom that still knows how to show off its classic attitude. That makes it a great total package thats ready to run right now. Call soon!